Find your next technology transfer department superstar. Placing your own job responsibilities on hold while you look through slush piles of CVs? Hires that don’t work out? Having empty positions that are taking too long to fill? Your department goals being at risk because of unfilled positions? Human Resources not fully understanding the specific needs of your tech transfer department? 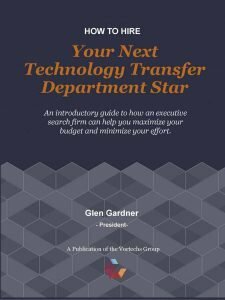 If any of these challenges are currently hindering your department, download the free How to Hire a Technology Transfer Department Star e-book. The secrets to approaching passive job seekers and why your next superstar is probably in their ranks. The true cost of an empty seat on your department and your ability to meet your goals. How the “mirror effect” is hurting your recruitment efforts. The most important things about hiring a recruiter, and much more.